It’s striking to imagine that the National Stadium, Surulere in Lagos, which was originally built to host local and international sports events has become a theatre of business and religious activities for all manner of people. Built in the early 70’s, the multi-purpose stadium which comprises of an Olympic-size swimming arena and a multipurpose Halls for basketball, volleyball, table tennis, wrestling and boxing matches, is currently dilapidated due negligence. The only cheerful thing worth celebrating was the statue of late Samuel Okwaraji outside the stadium, who collapsed and died while representing Nigeria in a 1990 FIFA World Cup qualifier against Angola on August 12, 1989. The stadium also provide sweet memories for Nigerians as the Green Eagles won the nation’s first trophy after beating Algeria in the final of the 1980 African Cup of Nations, thanks to goals from late Mudashiru Lawal Goal and a double from the ‘mathematical’ Segun Odegbami. Unlike in the western world where maintenance of stadium facilities remains a core responsibility of either the private sector or the government, the case is not the same with the main bowl as the Nigerian government have shown no clear interest in making it a priority to refurbish the edifice. Since hosting the 1999 FIFA U-20 World Cup, the 2000 African Cup of Nations co-hosted with Ghana, where the Super Eagles narrowly lost the trophy via a penalty shootout in the final to the Indomitable Lions of Cameroon and 2004 LG Cup match between Nigeria and Senegal in April, the stadium has never hosted any major football activities. A look within and outside the stadium gives one a perfect idea of what life looks like during the day and at night, where ‘night crawlers’ have found comfort without fear. Miscreants are loose masquerading everywhere to earn a living through persuasion of callers in broad day light and most times depriving people of their belongings. The patchy pitches and poor tartan tracks simply explain the state of the main bowl, which beats all imagination on why the federal government has decided to abandon the stadium without a concern. A stadium reputed for hosting major track and field events is now a den of robbers. Besides, the location of hostels around the stadium seem to have made prostitution a huge and striving business since football activities have ceased to take place at the stadium. A stadium which normally attracts tourists, sports lovers is now a haven for restaurant and fun seekers without direct benefit to sports activities. Interestingly, it’s a show of shame to imagine that the Nigeria security personnel (MOPOL and Police) have done little or nothing to safeguard the stadium environment from the onslaught of some miscreants hanging around there at night as a few of them have developed the habit of accepting stipends and letting them into the edifice at night. The main bowl is just a stone-thrown from the Teslim Balogun Stadium which hosted this year’s Federation Cup final that was won by IfeanyiUbah FC. Renovated during the administration of former Lagos State Governor, Babatunde Fashola, the stadium has taking lots of shine and glamour away from the Surulere National Stadium. 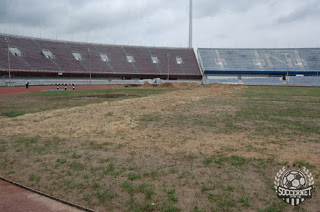 According to former Green Eagles midfielder, Henry Nwosu, he admits the National Stadium which suppose to be a home of sports, has been left to the hoodlums and unwarranted elements to habour without government’s determination to revive it. “I still can’t believe that the Surulere National Stadium, which hosted the 1980 African Cup of Nations final, where Nigeria won their first trophy; a thing I was part of, could be in this kind of mess. 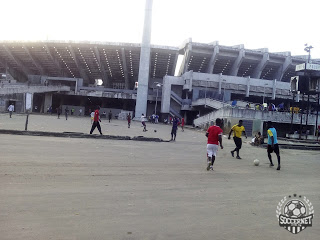 Ex international, Bayour Issah says the government has done little or nothing to improving the condition of the Surulere National Stadium, which he believed has been abandoned for church and wedding activities. 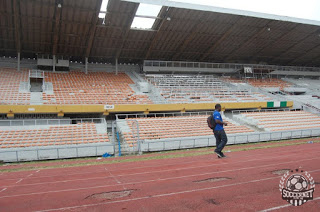 “It’s a big shame that the Surulere National Stadium has been left to rotten like egg. This was a stadium where we played and had a great time most especially with the vociferous noise of our home fans. Wow, the stadium has been abandoned for no reason, which gives me so much sadness. In the opinion of Atlanta Olympic gold medalist, Dosu Joseph, he blamed the lack of sporting activities at the Stadium for its sudden abandonment. “What do you think will happen to a stadium where sporting activities no longer takes place there again? The present state of the Surulere National Stadium is just an indication that the government is not ready to spend a dim in renovating the stadium. In the words of a seasoned sports journalist, Boluwaji Bamidele, he revealed that the National Stadium needs maintenance to reclaim its past glory of hosting sporting events. “Well, the National Stadium has not been in perfect shape despite the billions of money used to build the edifice and the huge amount of money budgeted every year for maintenance. More sporting activities and security of properties are needed so that the Stadium won’t just lie fallow. For once, the government and the Nigeria Football Federation should endeavour to join resources together in a bid to revive the dilapidated conditions of the main bowl, so that activities can resume at the stadium that gave the nation so much of attraction and glamour.